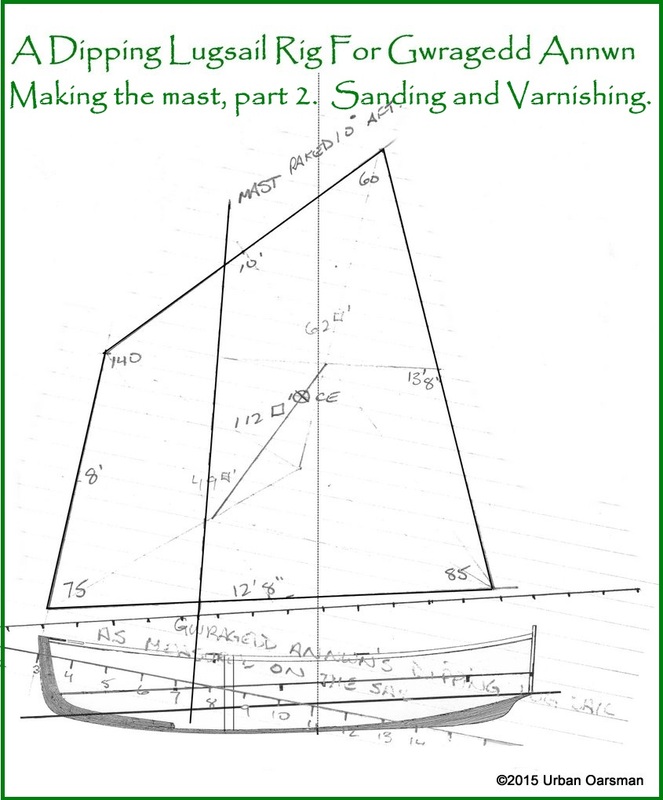 Gwragedd Annwn’s mast is 17’10¾” long, tapering from 2⅜” at the base to 2½” at the partners, to 2″ at the top of the mast. It weighs 19.4 lbs. 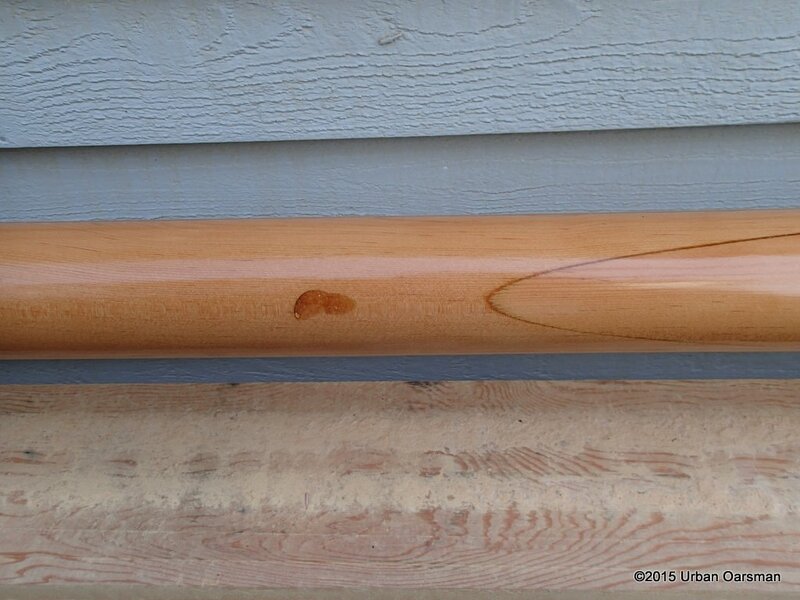 I have finished sanding the mast and put two coats of thinned semi-gloss spar Varnish on to seal the mast. I do not like gloss Varnish, always finding it too glaring in the summer sun. The top of the mast is held in the jig by a screw. 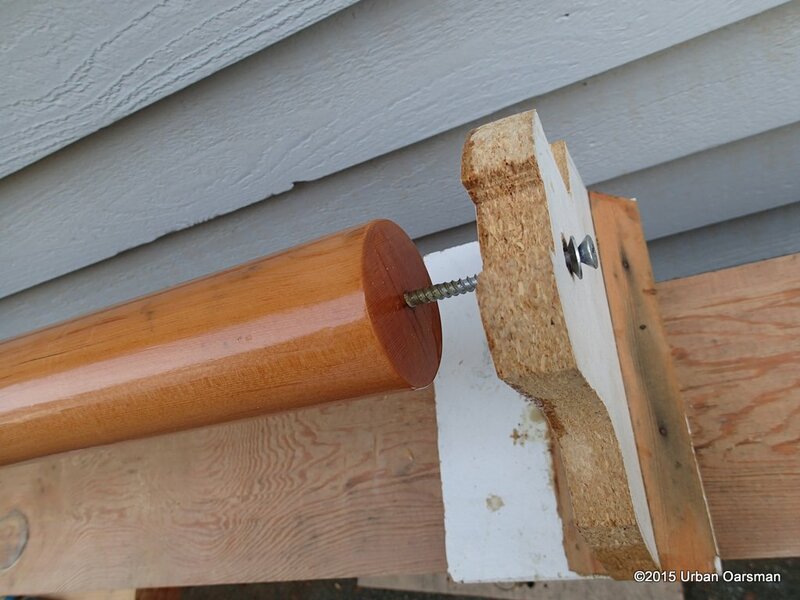 This allows the mast to be rotated during Varnishing. Time to add the coats! 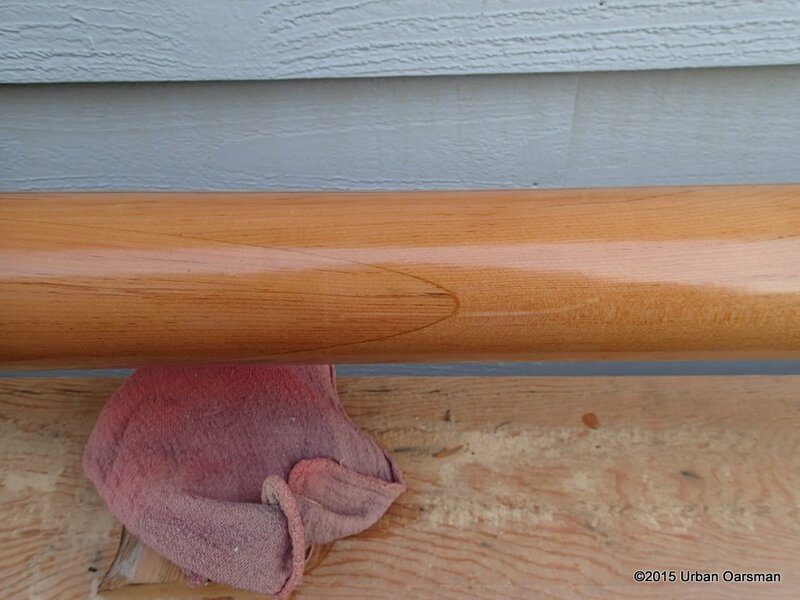 You should have seen the look on the face of the sales clerk when I asked him to put the varnish into the shaker. He thought I was asking him to perform an unnatural act. 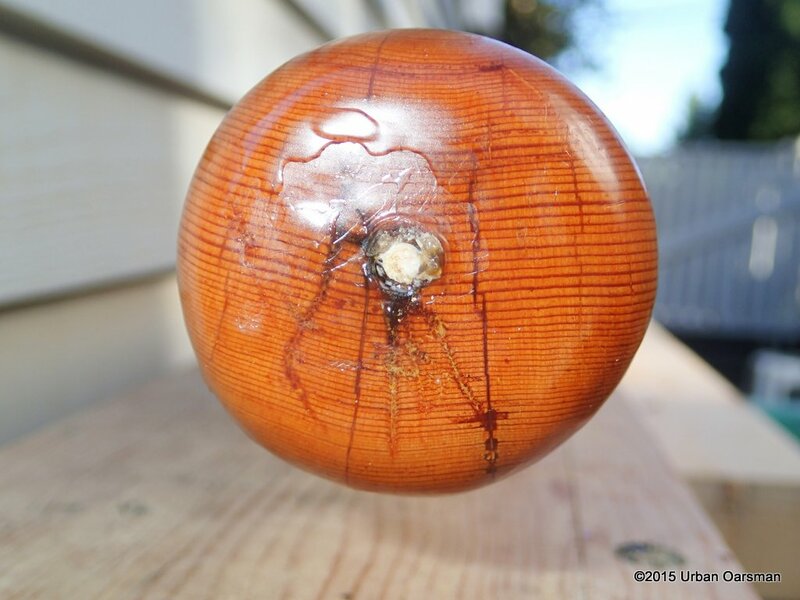 In 45+ years of varnishing wood, I have never brushed on bubbles “from the can”. 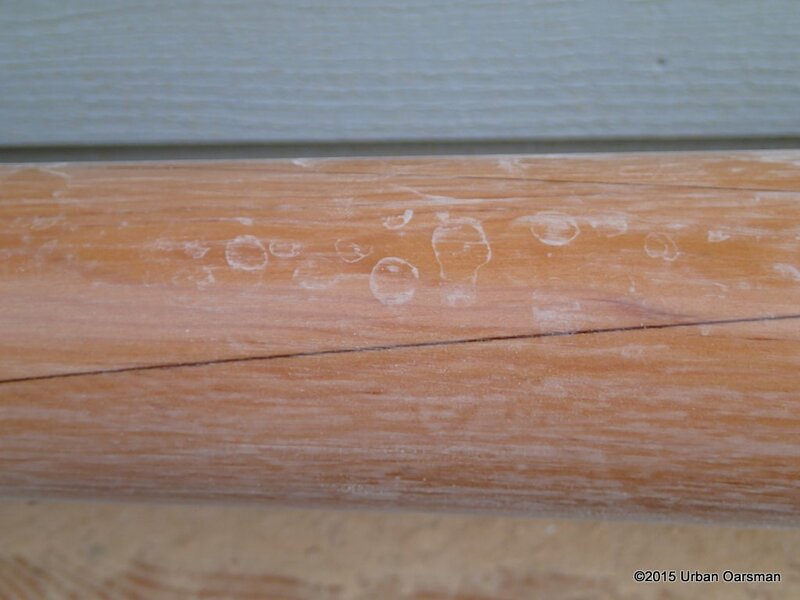 I have only had a bubble problem if the wood was warming up and off-gassing. By the time I got home and opened the can, there were no bubbles and the varnish was thoroughly mixed. Where the router slipped, filled in with epoxy and sanding dust. I varnish against the rules. We had a spat of warm, sunny weather here and I put on the next coat of varnish as soon as the prior coat was dry to the touch. As many as six coats in a day. 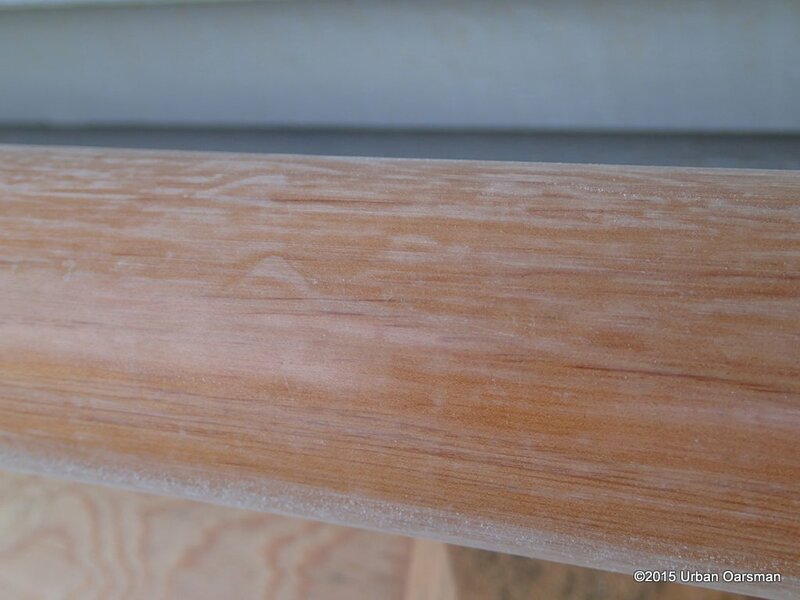 No sanding between coats. I did this for a week. I kept putting coats on until I had used up 90% of the one liter can, probably more than 40 coats. 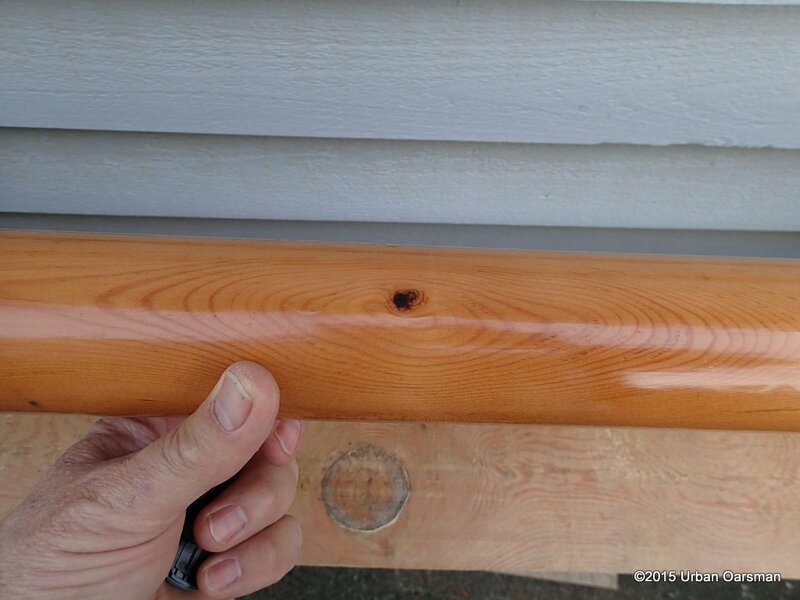 I discovered this technique when I varnished the red cedar railing on my house deck. 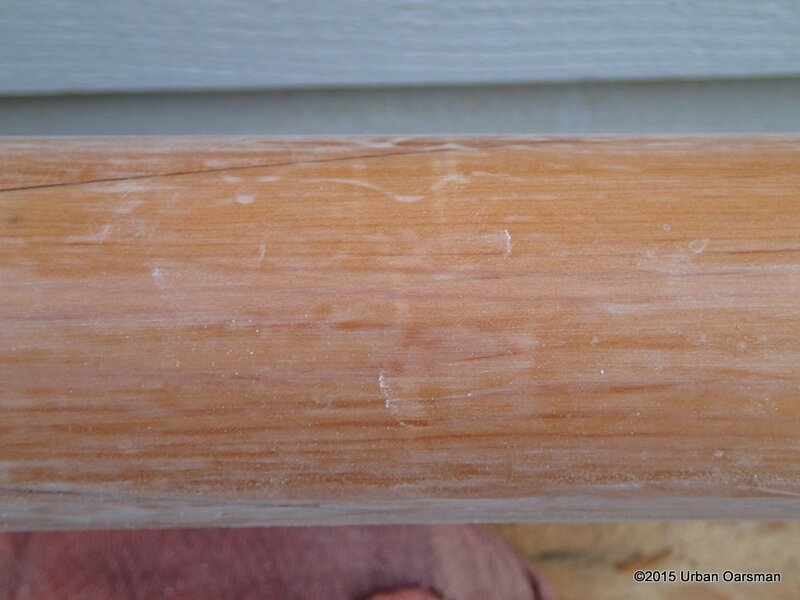 The finish on the deck railing, with minor touch-ups, lasted 23 years. I did another major varnishing this year, coating and re-coating until I used up the can of varnish. Should be good for another 23 years. 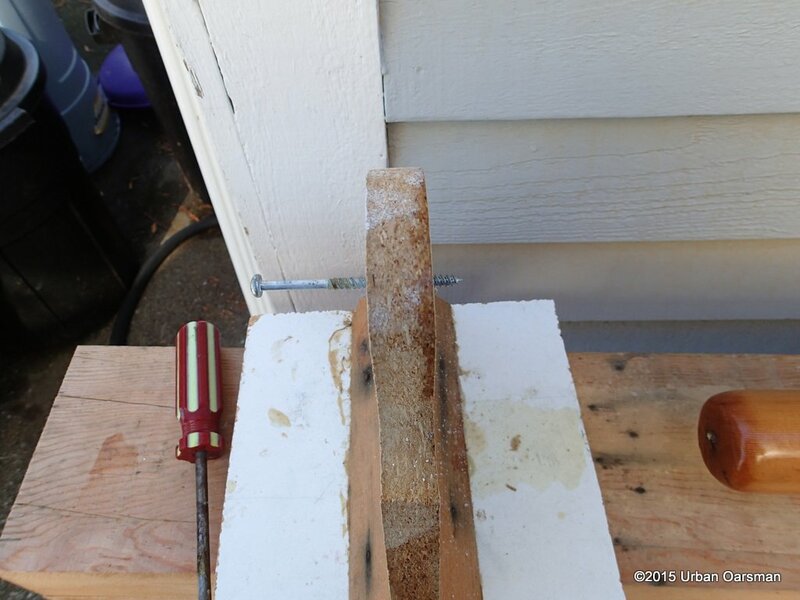 The clothes-pin splice needed a little filler, epoxy and sanding dust. The only problem that I have found with this technique is that the varnish takes a very long time to dry “Hard”. This is not a problem where you are not going to use the spar, oar, etc., for a bit. For example, when I did Gwragedd Annwn’s oars, I knew that they would sit with her, under her cover for two weeks before I would be using them. Gwragedd Annwn, sitting outside in the sunshine at Hollyburn Sailing Club for that time with the oars under her cover, thoroughly dried them out. 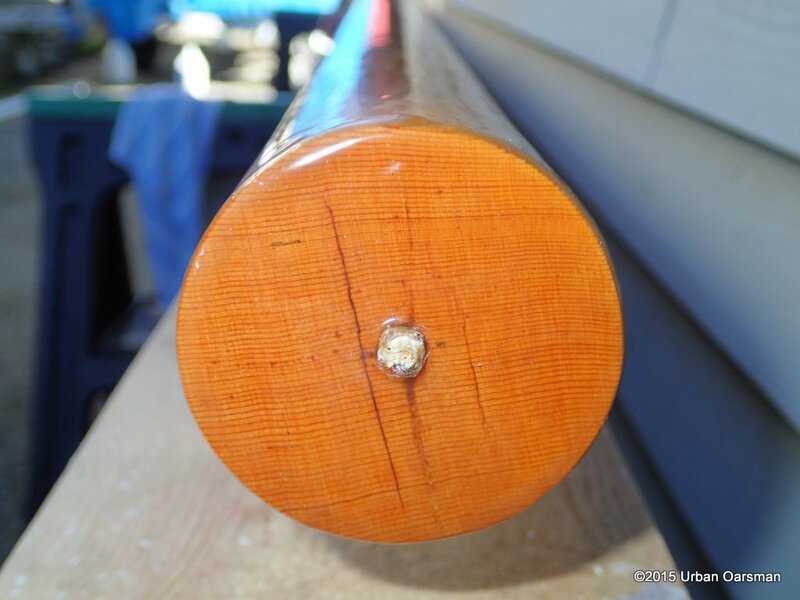 The base of the mast, held by a screw. 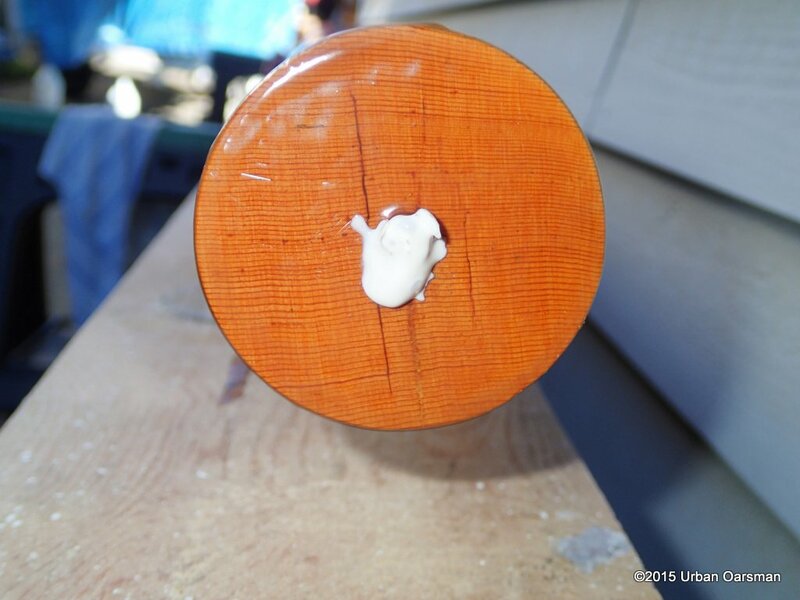 I used a screwdriver in this screw to rotate the mast when Varnishing the base of mast. 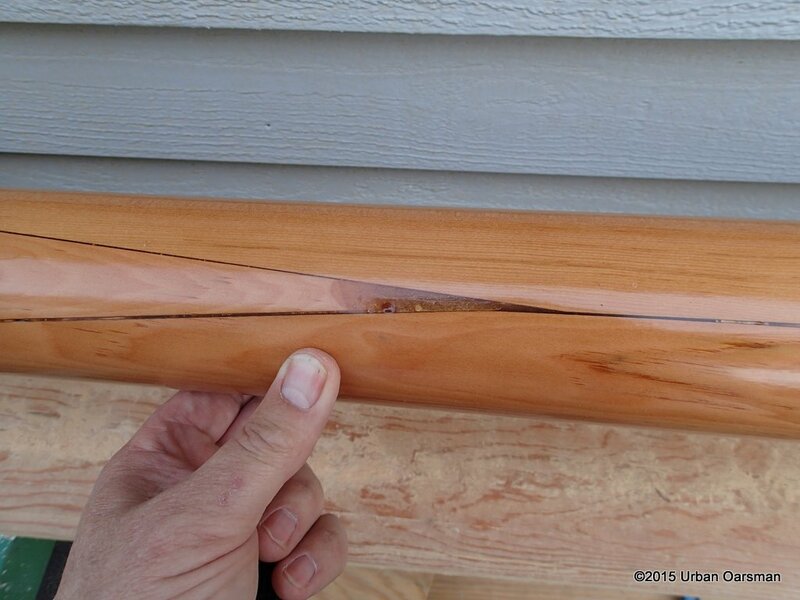 The problem with using a rotating jig for Varnishing is that you end up with screw holes in the ends of the mast. This knot was small enough to leave in. 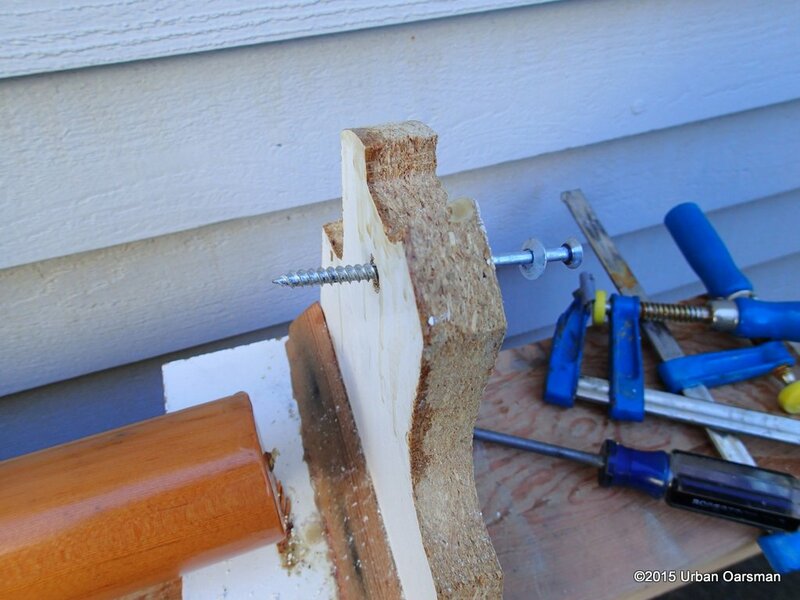 The clothes-pin splice jig worked very well. I think that this is a good scarph. 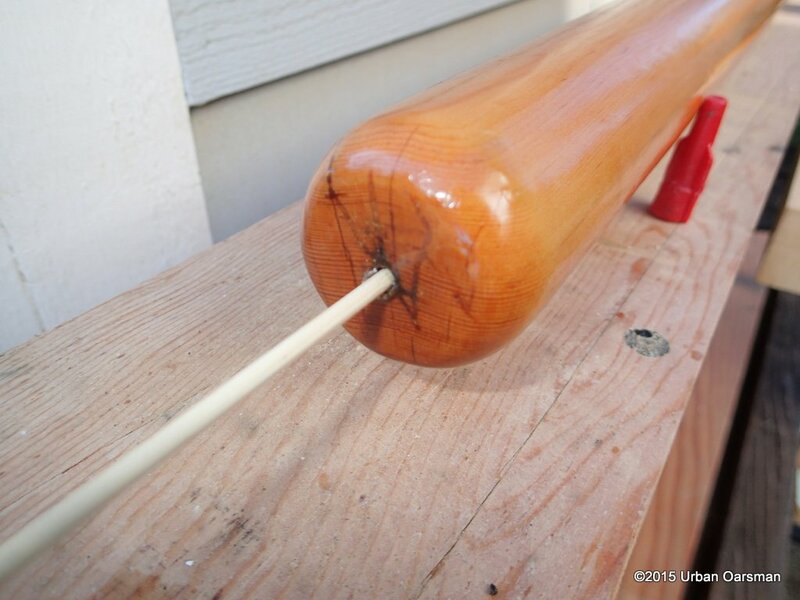 Top of the clothes-pin splice and the gouge made by the router slipping. Sanding the varnish for the final coats. It does not matter how careful you are, I always seem to get some runs and sags. I used 220 and them 320 grit sanding paper. A quick wipe with a turpentine rag to take the dust off and then more Varnish. 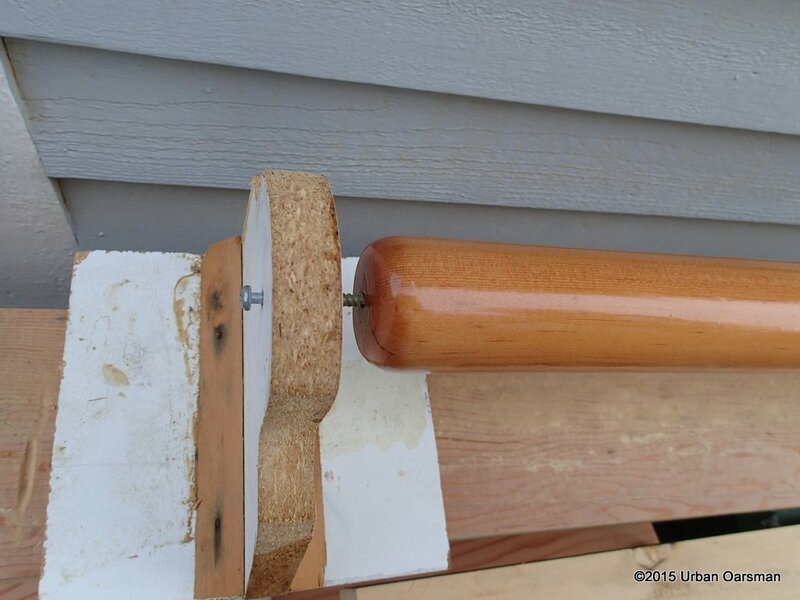 The rotation jig, with the screw backed out of the top of the mast. The rotation jig at the base of the mast, mast removed. Ready to fill in the rotation jig screw holes. 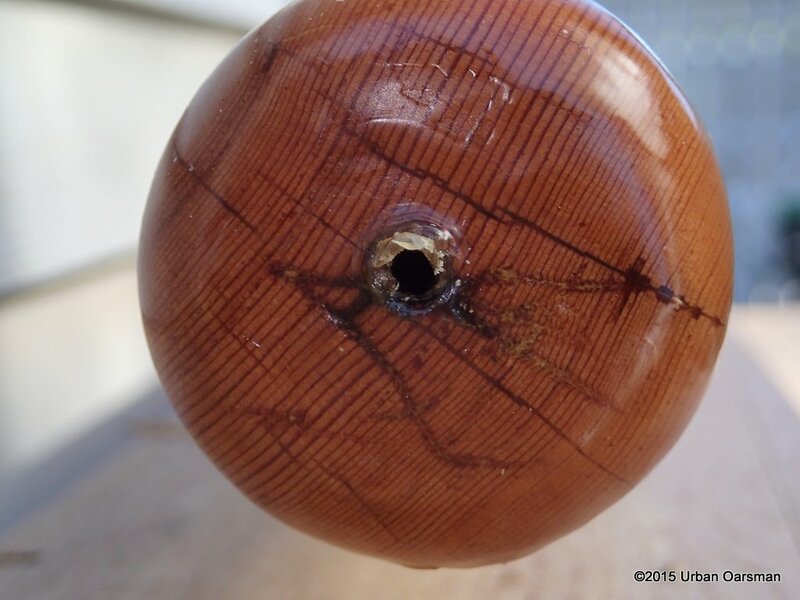 The screw hole in the top of the mast. 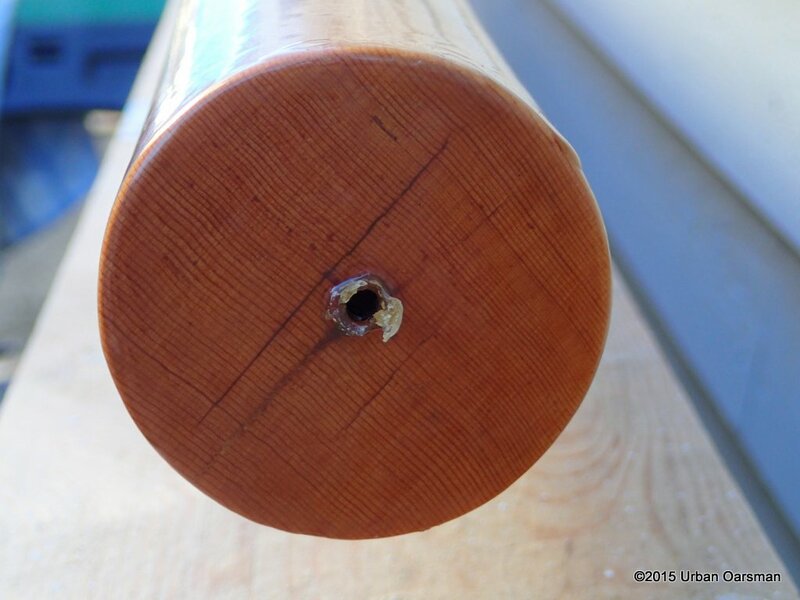 The screw hole in the base (bottom) of the mast. 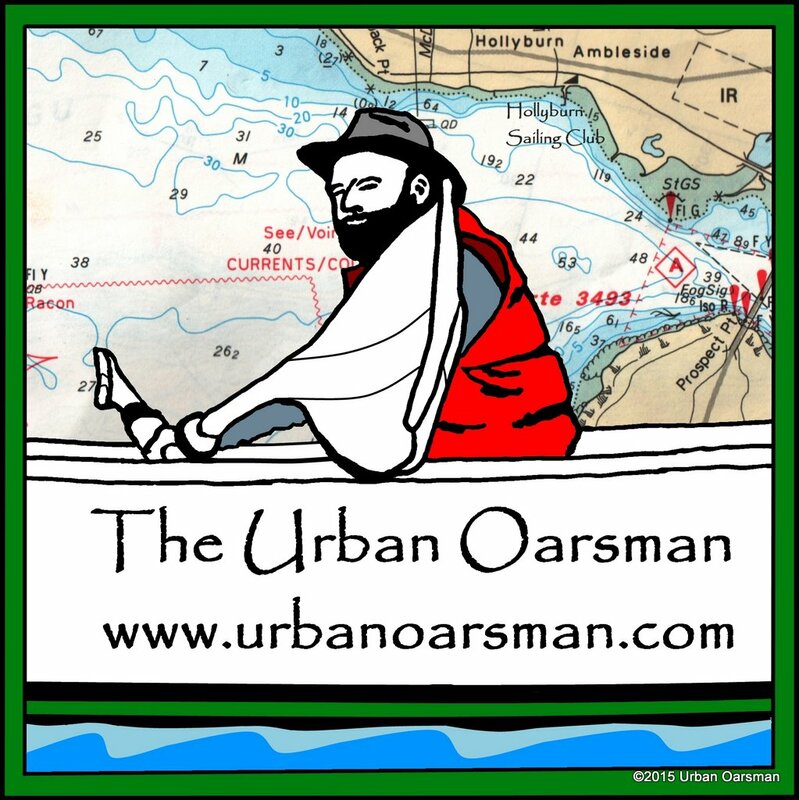 I printed two Urban Oarsman logs and used the varnish to glue them to the mast. Again, it takes forever for the varnish to dry under the paper and stick the decals to the mast. 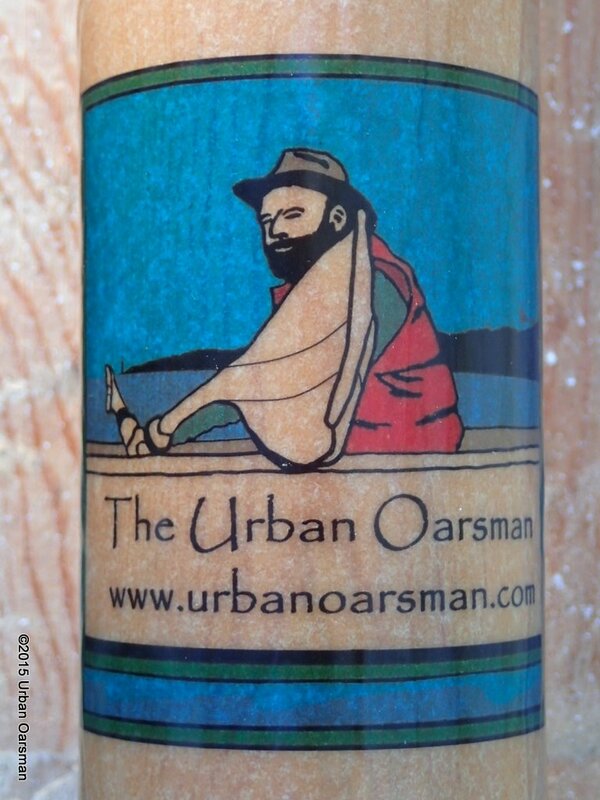 Urban Oarsman logo Varnished onto the Forward side of the mast. 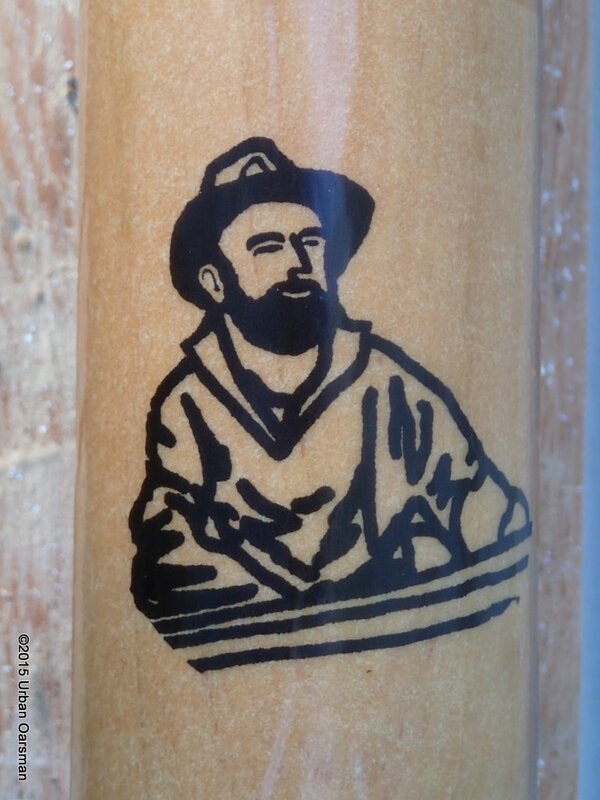 Old Man Bretner, Boatbuilder logo Varnished onto the Aft side of the mast. 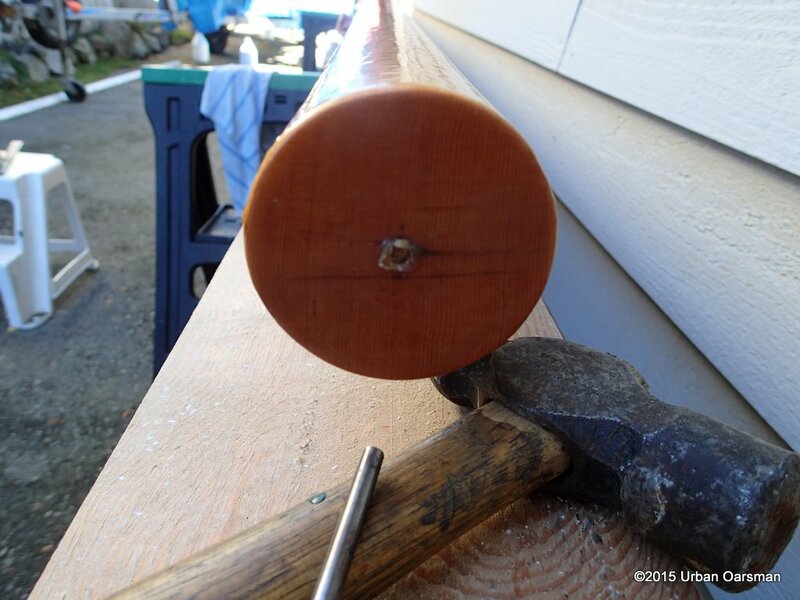 Fitting the bamboo skewer for the top hole. Excess wiped off of the base. Excess wiped off the top of the mast. 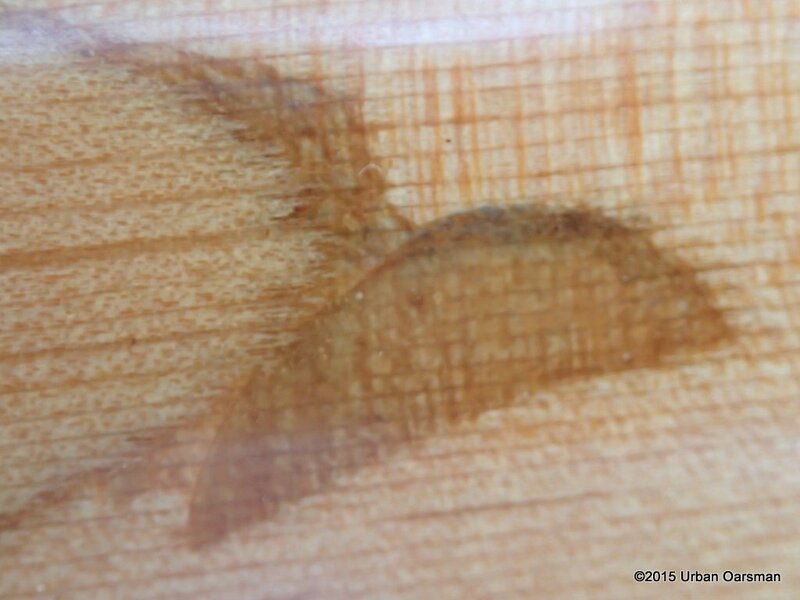 You can see in the above photo where the coats of Varnish have sagged. I will fix these when I Varnish over the bamboo skewers. 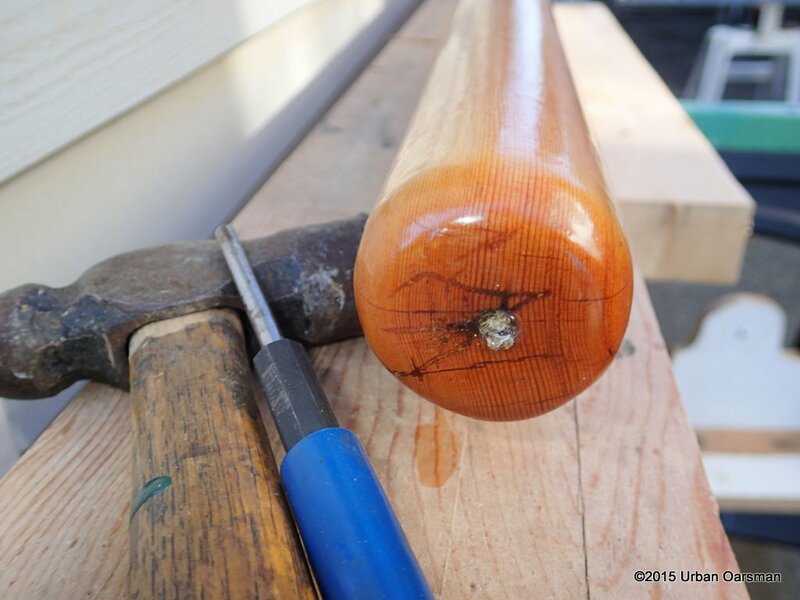 I used a hammer and a punch to insure that the skewer was all the way in. 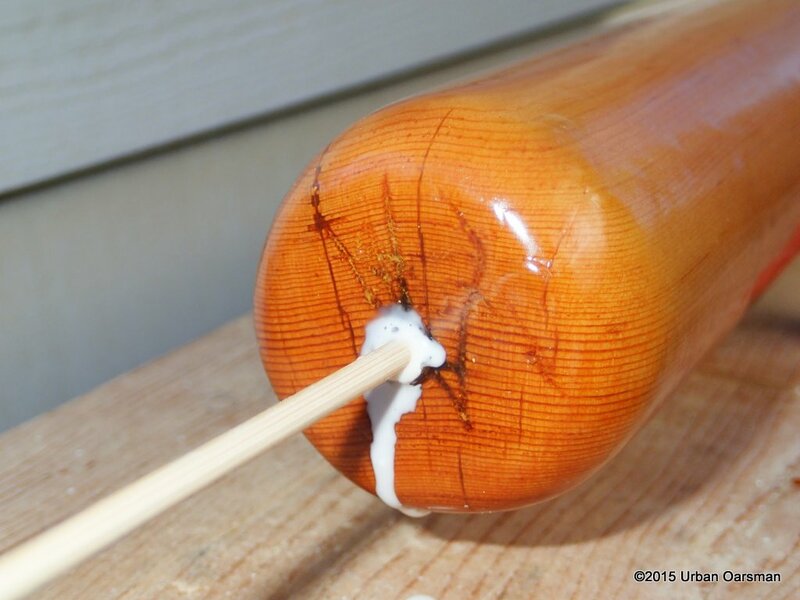 The next step will be to varnish the mast ends over the bamboo plugs when the glue has dried.